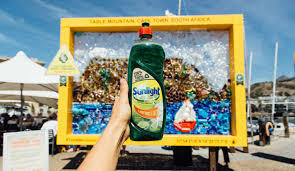 Sunlight Dishwashing Liquid in South Africa has introduced bottles that are made from 100% recycled plastic as well as being fully recyclable. This is a first for the brand and for our South Africa business. It also marks a significant step towards our goal of ensuring that all our plastic packaging will be fully reusable, recyclable or compostable by 2025. In addition to reducing its own environmental footprint, the brand – which is a trusted household name in South Africa – wants to inspire consumers to play their part by recycling and choosing more sustainably-focused products. “As the number one selling dishwashing liquid in South Africa, we believe Sunlight has a responsibility to lead the agenda in sustainability,” says Brand Manager Nobuhle Ngubane. While all bottles in the Sunlight range are recyclable – which means they can be recycled back into new plastic – the 750ml and 400ml packs are the first to be made using 100% recycled plastic. The reason it’s only these two pack sizes at the moment is largely down to how much recycled plastic there is on the market to feed into the manufacturing process. As more becomes available, we’ll start shifting other packs across the portfolio to 100%. Similarly, we’re working to make our refill packs recyclable. The packaging is currently being developed and will be trialled during the first half of this year. If successful, we’ll start rolling it out with the aim that all refill packs will be also recyclable by 2020. The move to 100% has taken some time as it has been dependent on a number of factors. While the consistent supply of quality recycled material has been a major driver, the bottles had to be put through rigorous testing to ensure they came up to stringent standards and were safe for consumer use. We started off at 25% recycled content, moved to 50% in 2015 and were finally able to produce a 100% recycled bottle in 2018. The brand launched a new sustainability campaign on 18 March – Global Recycling Day – encouraging the public to take the #SunlightPlayYourPart pledge and commit to recycling plastic. It has also donated R10,000 to the Oasis Association, which helps those with learning disabilities by providing job opportunities and skills development at recycling centres across the country. The brand has promised to double its donation if 10,000 South Africans make the #SunlightPlayYourPart pledge. According to Plastics South Africa, in 2016 the country accumulated over 1.14 million tonnes of plastic waste, less than half of which was recycled. Although conversations around recycling and plastic waste management have increased in recent years, there remains a staggering amount of unrecycled plastic in the waste stream and much work to do to address the problem. With a substantial volume of products in the market, we felt a duty to act. In 2010, we launched the Unilever Sustainable Living Plan to accelerate efforts towards a more circular economy, and in 2017 we introduced our more ambitious targets around plastic packaging. We have made good progress against our goals, but we continue to ramp up our efforts. One way we’re doing that is through the Africa Plastics Recycling Alliance, which we have just launched alongside other international consumer goods companies. Its aim is to turn the current challenge of plastic waste in Sub Saharan Africa into an opportunity to create jobs and commercial activity by improving collection and recycling infrastructure and systems. As Luc-Olivier Marquet, EVP, Unilever South Africa, says: “Plastic to landfill is a major issue, especially in developing and emerging markets. South Africa is no exception, even worse than many others. Unilever, as market leader, has to take the lead to reduce our impact to the environment.